This article talks about a number of interesting points worth mentioning. It seems that a number of users are not aware that capping policies were put in place, and continued downloading as they used to without caring for a limit. And now, Orange is surprising them by saying “Hey! You downloaded too much dude! You will be capped!”. Personally, I don’t know anybody who got a warning for over-downloading (yet). We know there are capping policies, but I didn’t hear of anybody getting a letter or call, or anything like that to inform them of going over the cap limits. Next, it seems ACIM (Association des Consommateurs de Maurice – I think) is not very pleased with Orange’s practices, reporting that even if Orange applied their capping in other countries, it should not do so here since there is hardly any competition in the ISP (Internet Service Provider) sector. Abroad, if you are not satisfied with your ISP, you can choose from a dozen others, while here, you are stuck with two or three, like Nomad, DCL and Emtel if you can afford the modem. Azu of MTML is not on par yet, with lowly cap limits of 1GB I think. ACIM giving the matter focus is a good thing for us all, even if you are not a heavy user. What is heavy usage anyways? Orange says [2000 MP3s or 14 Movies] for ADSL 128K Home and [3000 MP3s or 28 movies] for ADSL 512K Home per month. Seriously, is this how you measure bandwidth usage? In terms of MP3s or movies? It’s like measuring the speed of an airplane by how many clouds go by in 1 hour! Please, just tell us what is the real cap! Just tell us plainly “You are allowed x GB of bandwidth per month”! Things like MP3s and Movies have varying sizes. I can say an MP3 has an average size of 5MB and I’m being conservative. A movie, assuming a DVDRIP is 700MB. Notice that no format is given. What is the movie encoded in? AVI? MKV? The size would greatly vary, almost in a 1:2 ratio! Ok, so I assume 700MB, then I estimate the cap to be around 9800MB or 10GB for 128K and 20GB for 512K? We are not told! And what’s with the idea of telling people they can “download movies” and “download MP3s”? Is that some kind of condoning of piracy? What I read here is this: “Pirate a bit, but not too much, else your speed goes down”! 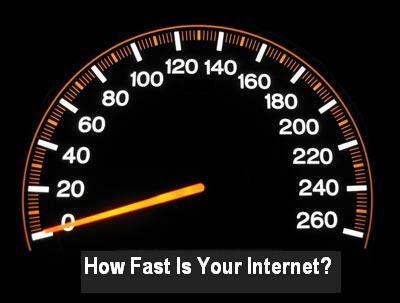 Another issue: we are not told by how much our speed decreases. What if my speed goes down from say, 512K to 128K if I go over the cap? That’s 4x less than what I’d be paying for! Plain unfair! And finally, in countries where caps are implemented, there is the concept of peak time and off-peak time. Caps are only implemented during peak time, and you can leech to your heart’s content off-peak. That is, if ever you find your speed reduced because you went over-cap, then the reduction only applies during peak hour, and the limits are lifted off-peak. This is a good idea, if ever caps are to be implemented. And duh, anyways, the caps abroad are > 200GB! Consider Comcast’s 250GB limit, compared to our paltry 20GB. And we don’t even come close to Comcast’s speed packages, so it’s definitely not worth comparing us with them. 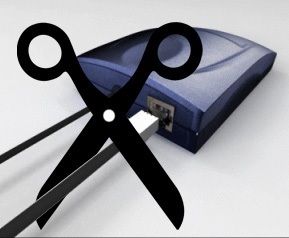 France wants to step up the pace of war against piracy, by adopting a new law that will make it possible to ban users from using broadband Internet for up to a period of one year. The new law would make use of a 3-chances policy, and after you are caught downloading illegally for 3 times, you are barred form using the Internet. As simple as that. Quite a radical measure you might say, considering that till now, people were only threatened or advised not to download illegal material off the Internet. Now, as I said, the French authorities want to literally keep you away from the content you so much want to download, whether you like it or not. And apprently, this new law seems to receive support from the French president, Nicholas Sarkozy. Why am I blogging about this? Just take a look at who is our main ISP is. Orange. Any bells ringing yet? No? French ISP then? Yep! Orange is a French ISP, and if this law is actually accepted in France, and if all French ISPs are to sign it, I believe this would include Orange. 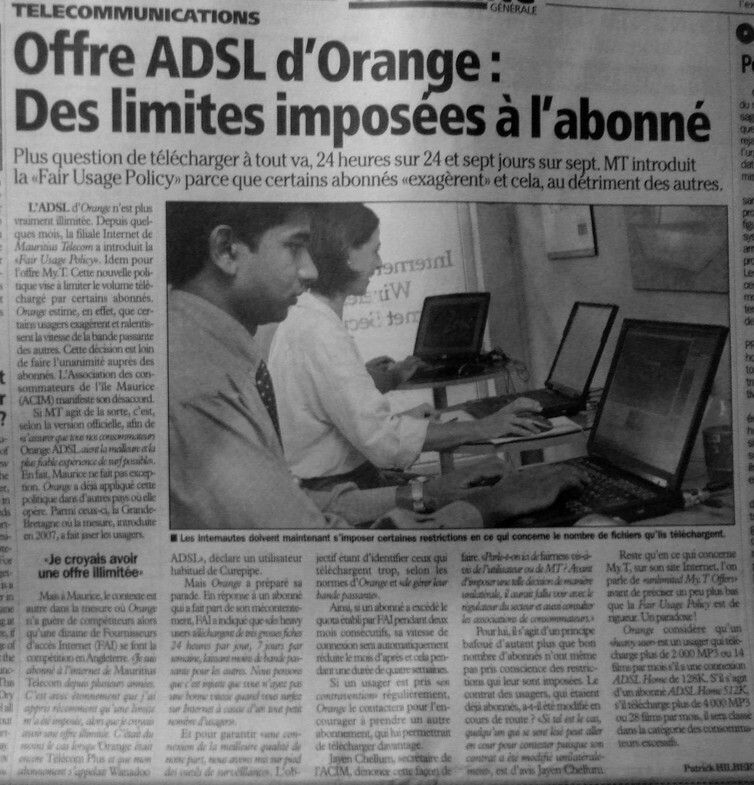 Now, I’m not really sure how this would work, but is there a risk that Mauritian Internet users will be affected too? I don’t know. I’m no law student. But if anybody can bring any clarity to this matter, your comments are most welcome. I wonder what would happen if somebody happened to be leeching off their neighbour’s wireless connection and downloading illegal content, and the connection owner gets caught. Who goes down? The owner or the leecher? I personally think these “repressive” ways will not end piracy. Waging war on your own customers is never great. In my opinion, offering better content, more content at affordable prices would really tempt customers away from illegal downloading. If only “download all you can” for a reasonable price ($10/month?) existed, it would be real bliss. Cheap prices, availability of extra content and services and total freedom. I believe this would be what an average customer like me would ask for. Not much huh?